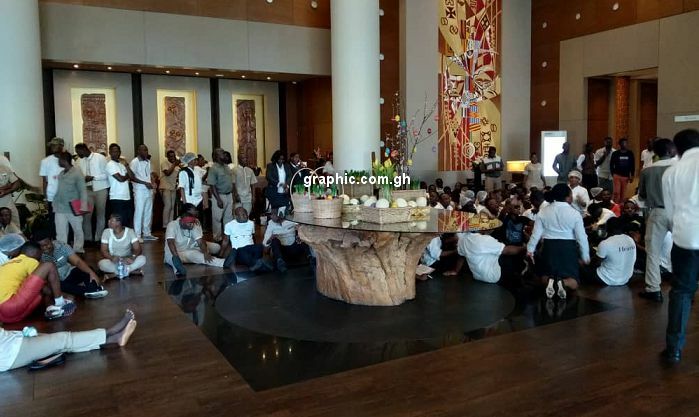 Staff of the Mövenpick Ambassador Hotel in Accra have laid down their tools in protest of what they describe as racist treatment meted out to them by management of the hotel. According to them, the unfair treatment has persisted since 2011. The staff, numbering about a hundred, who pitched camp at the reception of the hotel amidst drumming and war songs on Wednesday afternoon, say they will not return to their post until the General Manager of the hotel Michael Rathgeb - who they accuse of overseeing the racist treatment is dismissed. Some guests at the hotel who have been abandoned with no staff to assist them have joined the media to witness the demonstration. Some staff who spoke to Graphic Online alleged that Ghanaian workers were treated harshly and dismissed by the hotel when they committed misdemeanours such as stealing pens while expatriate staff were let off the hook when they stole from guests. They also alleged that a female expatriate staff who stole gold bars from a guest remains an employee of the hotel even after she was arrested by police.